​note: not all ELA classes are using this book as evidence in the comparison essay. Check with your teacher to see if you may use this in your essay. ​When all your citations are in NoodleTools, you're ready to export to Goog﻿le Docs to create a proper MLA works cited page. NoodleTools will open your works cited for you you in a new Google Doc called "Sources for (the name of your NT project)"
Paste in your exported works cited into this blank, last page of your essay. Use in-text (parenthetical) citations after each example taken from a book, painting, website, etc. DO NOT underline your title, put it in bold, put it in italics, or put it in quotes! 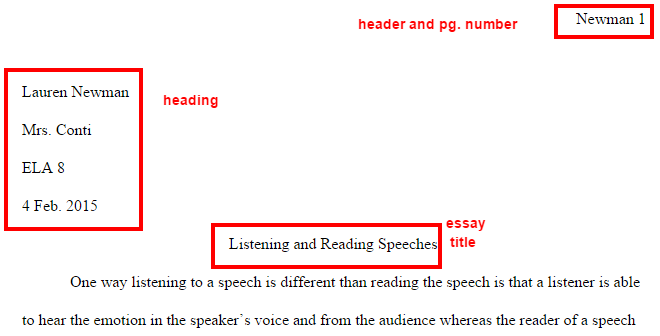 Sample essay format: Be sure to replace my name with your name! Be sure to create your own unique title that reflects the content of this particular essay! ​In-text (parenthetical) citation help - click here!